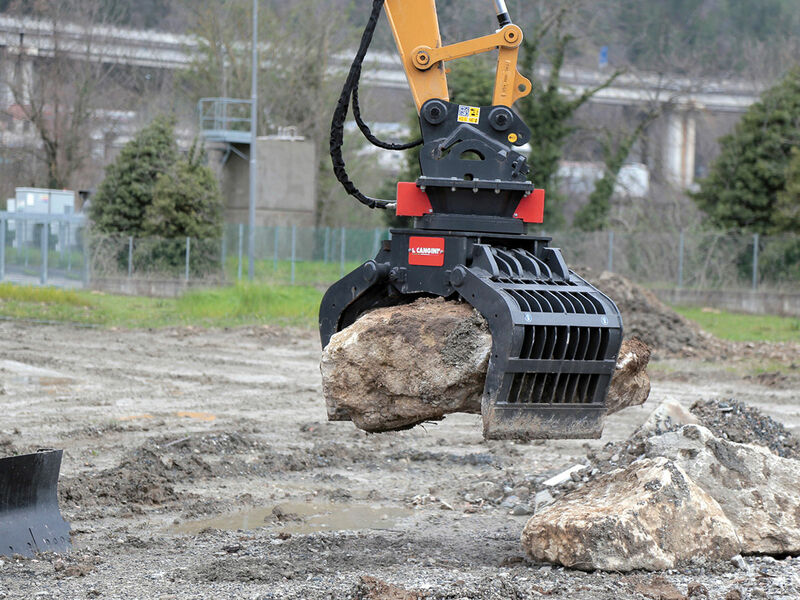 Cohidrex is the authorized dealer of this Italian brand that makes all kinds of attachments for mini and midi excavators and backhoe and skid-steer loaders. Thanks to this, we enhance our product range and, hence, the solutions we may provide our customers with. 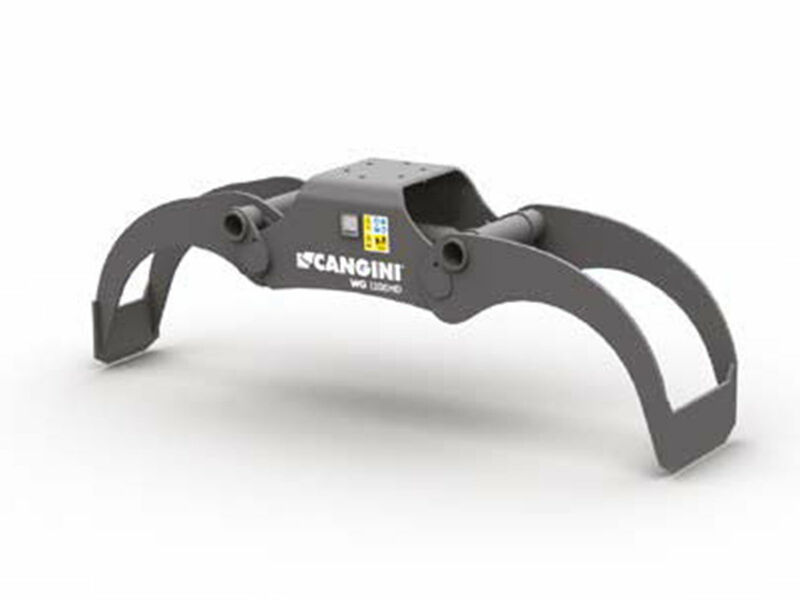 Its shape has been conceived to help the tool to penetrate medium-consistency soils. 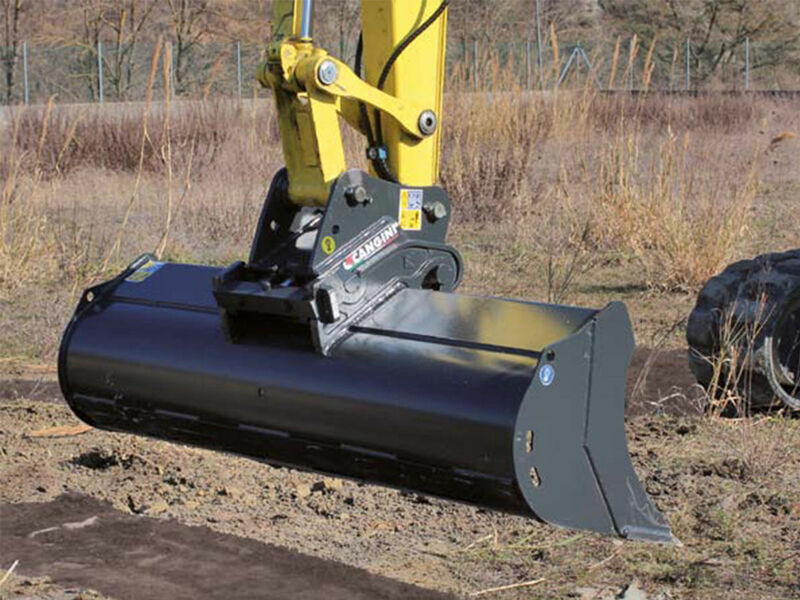 Its elongated profile avoids that the ground sticks to the bucket’s side walls and simplifies the discharge of loamy and wet materials. 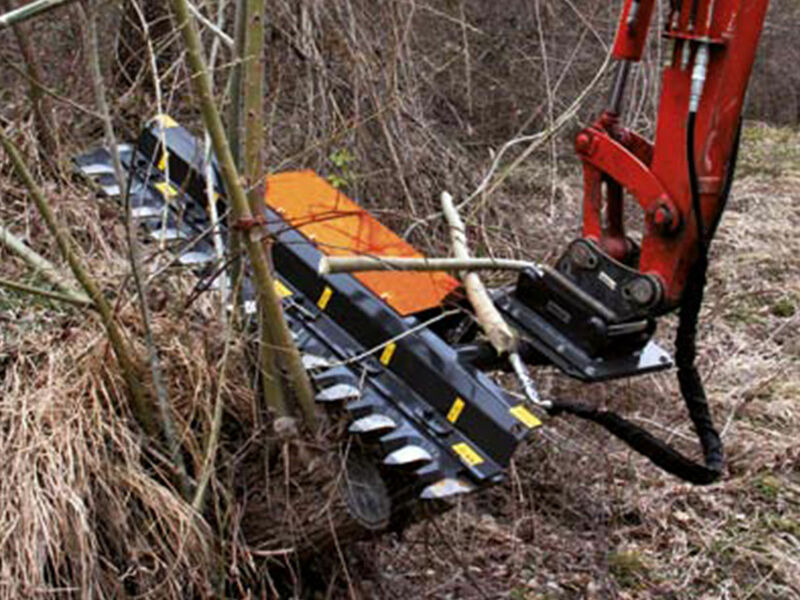 Its profile has been designed to help the tool to penetrate mostly rocky grounds. 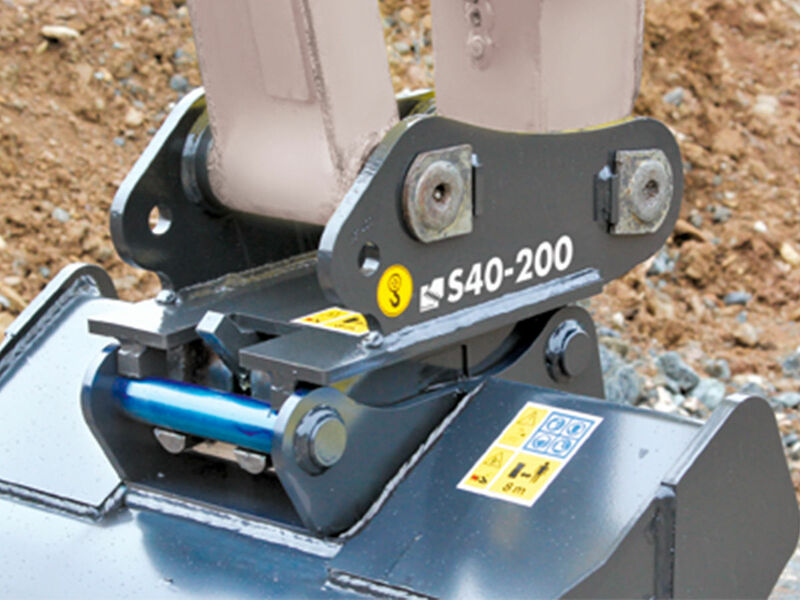 Supplied with HB400 side reinforcements, strips, cutters and blade guards to guarantee high resistance to wear. 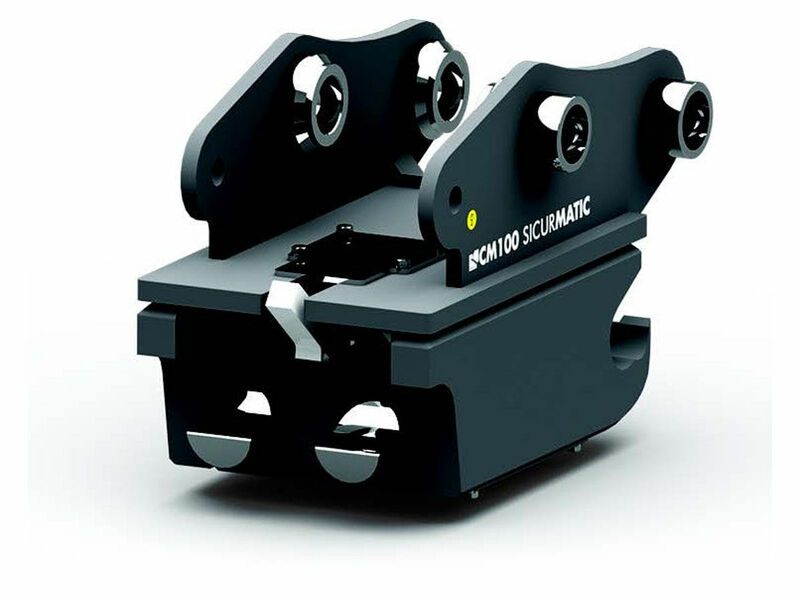 These HB400 cast cutters are positioned on the surfaces mostly subject to wear granting a higher resistance. 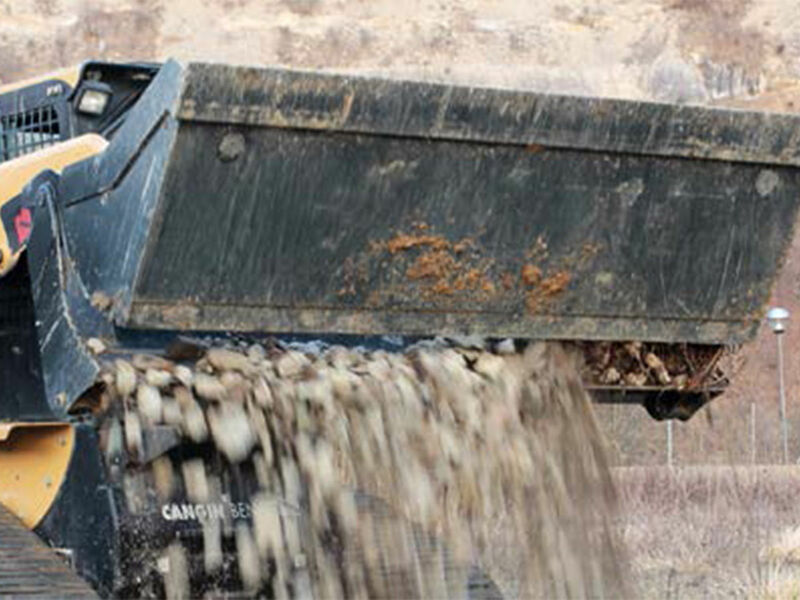 The skeleton bucket is designed to sort stones and aggregate materials. The sieved material’s size depends on the distance among the grids. 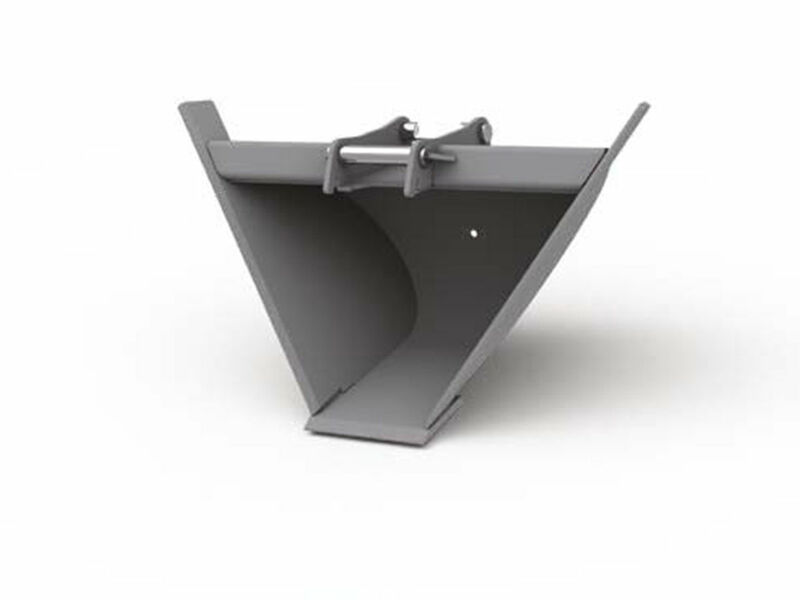 Its trapezoidal shape and side tilting angles (52°-60°) enable the realization and maintenance of ditches and drains of different sizes and angles. 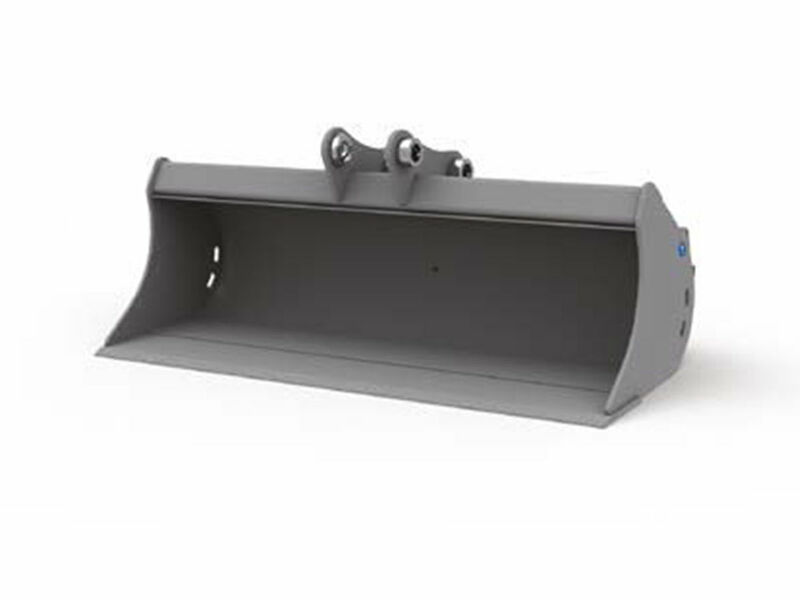 Its enlarged and low-profile shape makes it suitable for the realization and maintenance of drains, ditches and earth banks. 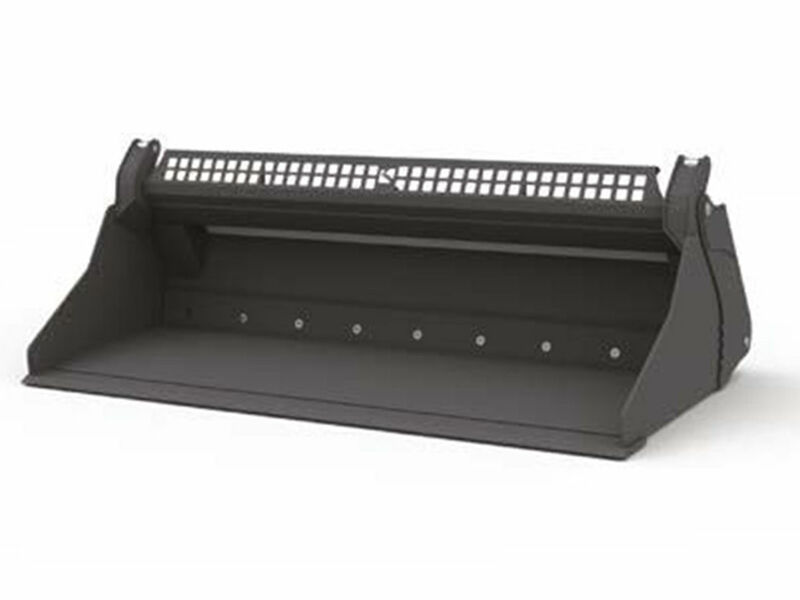 Supplied with holes on walls and bottom for the water drainage. 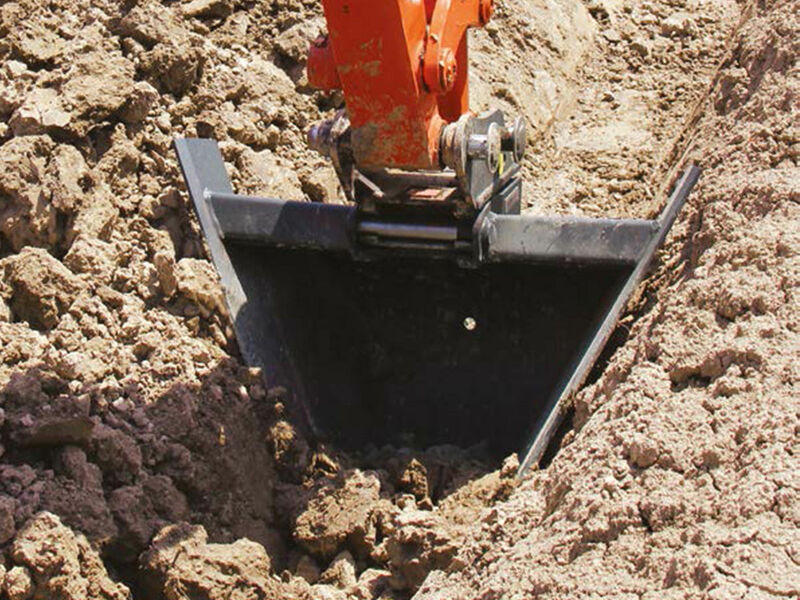 Particularly suitable for finishing and levelling works. 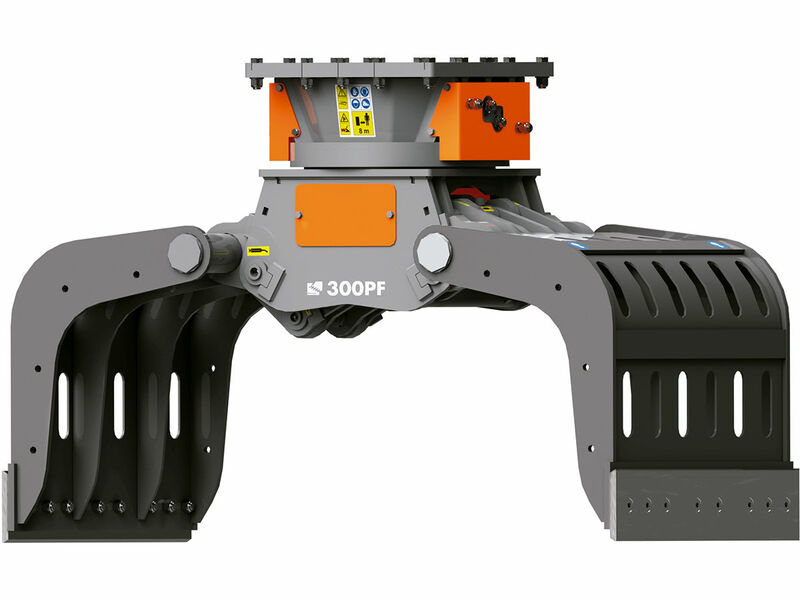 Its tilting mechanism enables to tilt the bucket by 45° on both sides. The standard block valve enables to keep the angle. 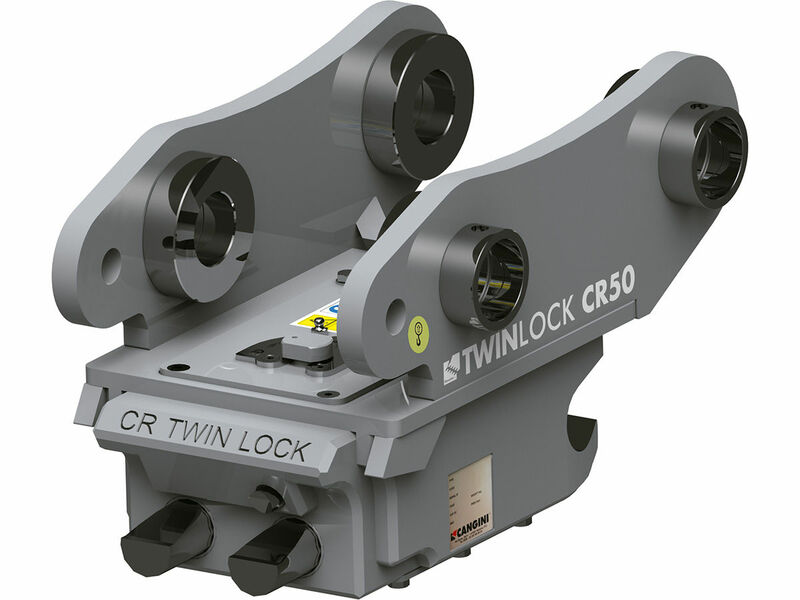 The CR Twin Lock patented reversible quick coupler enables the fast locking and unlocking of the attachment tools considerably reducing the time for their replacement. 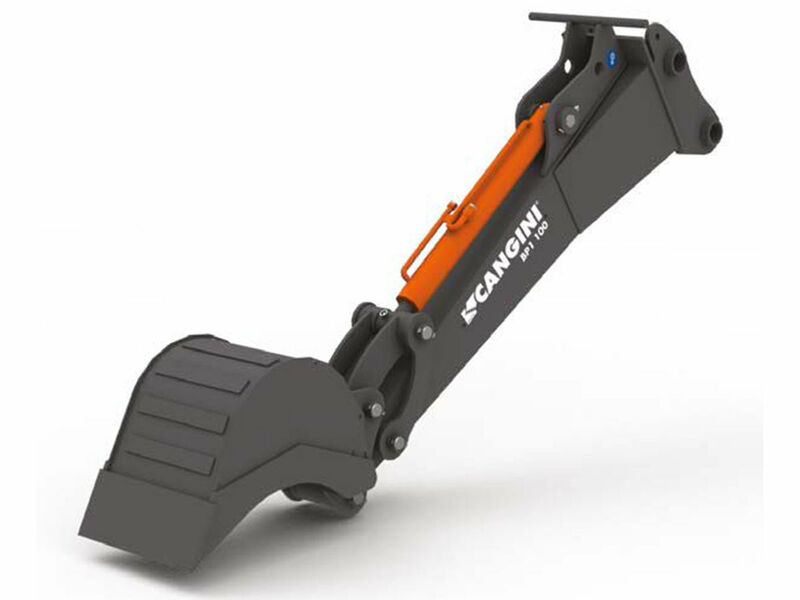 The mechanical version is provided with a semi-automatic system that requires the manual intervention when the tool has to be released. Both the locking and the safe blocking of the new tool are automatic operations. In the hydraulic version all these functions are managed directly from the cab. 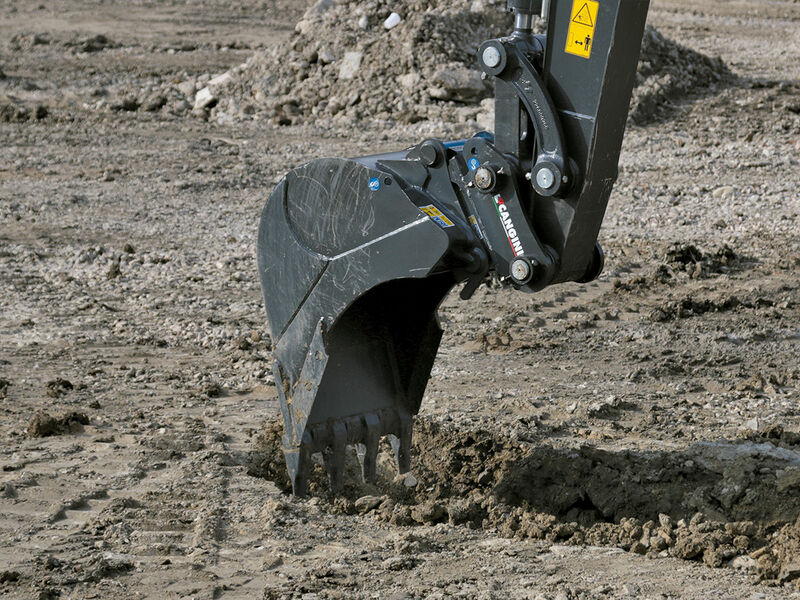 The reversible CM SICURMATIC quick coupler is equipped with the most advanced safety systems: the front safety system that is activated when the pins come out; the fork with its new double-notch profile; the visual indicator that shows the operator the locking status from the cab. Sides are made in HB400. 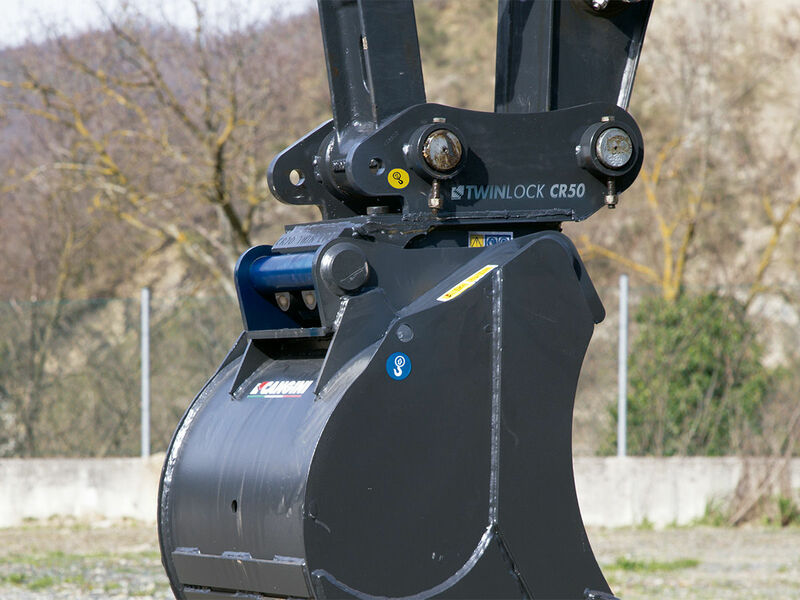 Thanks to its semi-automatic system, the mechanical version requires the operator’s intervention only during the unlocking phase, while the locking function is automatic. 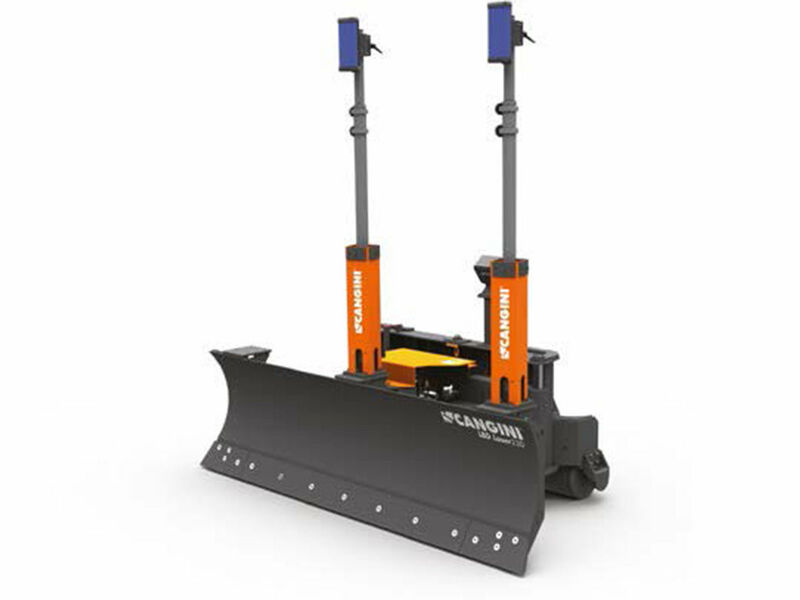 With its double-effect system, the hydraulic version allows to manage both the locking and unlocking operations directly from the cab in a few seconds. 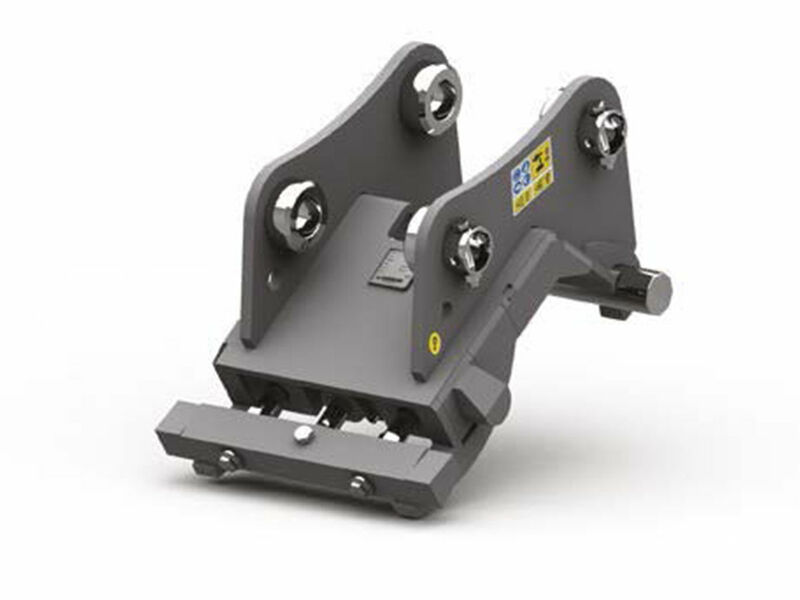 The S Nordic System reversible quick coupler enables the fast locking and unlocking of the attachment tools considerably reducing the time for their replacement. 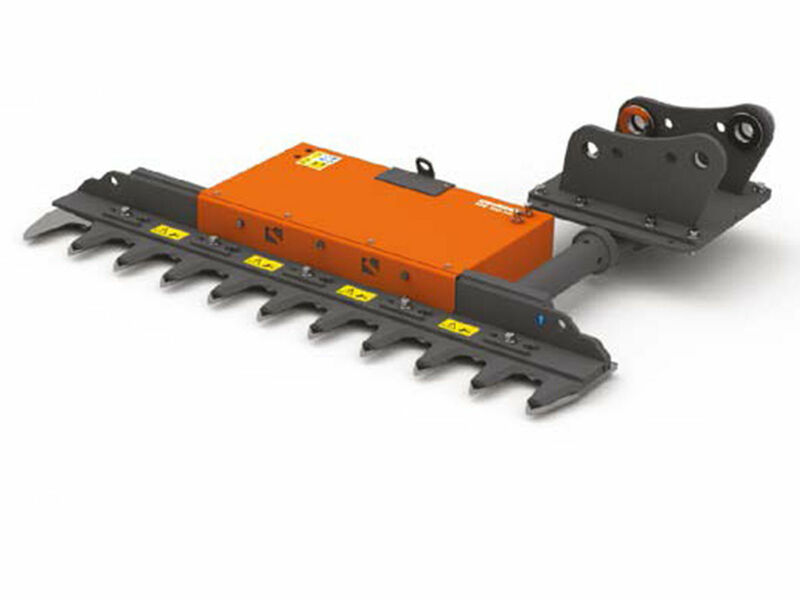 HB400 side platesThe mechanical version is provided with a semi-automatic system that requires the manual intervention when the tool has to be released. The locking of the new tool is an automatic operation. In the hydraulic version all these functions are managed directly from the cab. 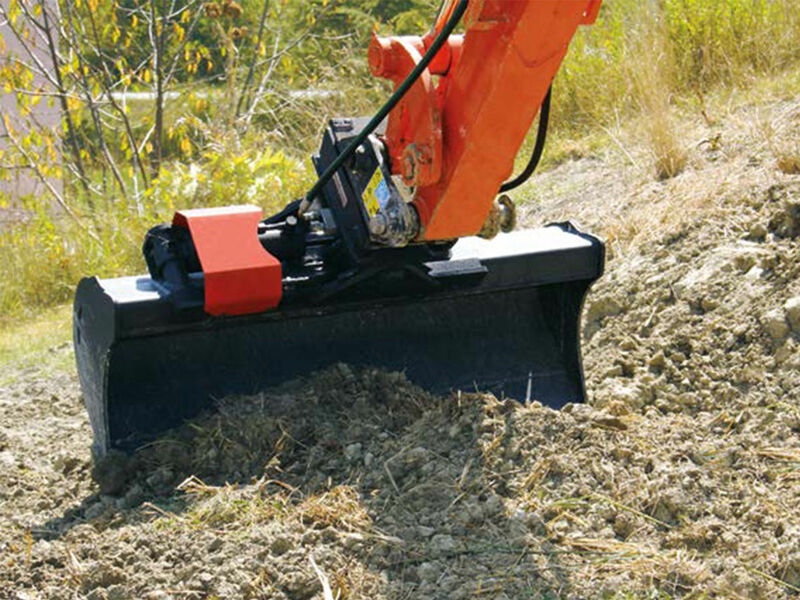 The Hand’o’Lock quick coupler allows the fast replacement of the attachment tools. 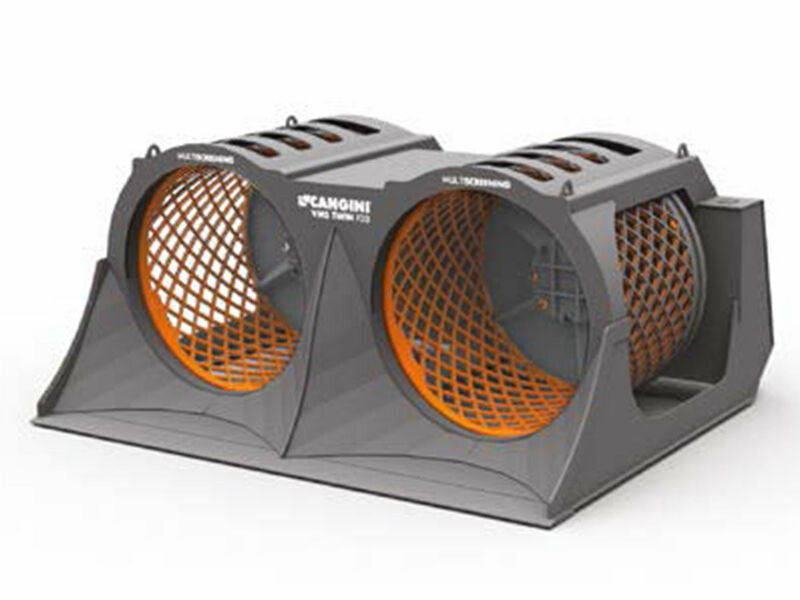 Thanks to its simple and strong frame it can rely on an excellent quality-price ratio. 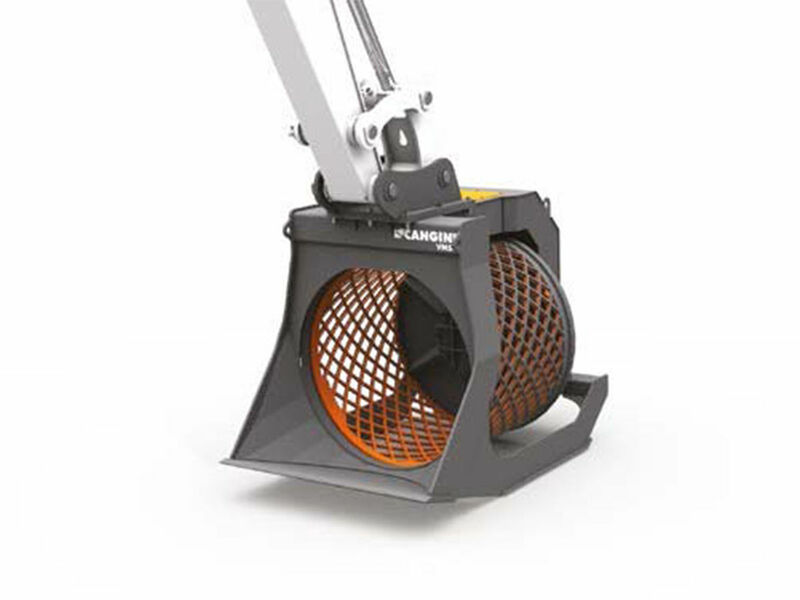 In its hydraulic version it enables the fully automatic locking and unlocking operations. 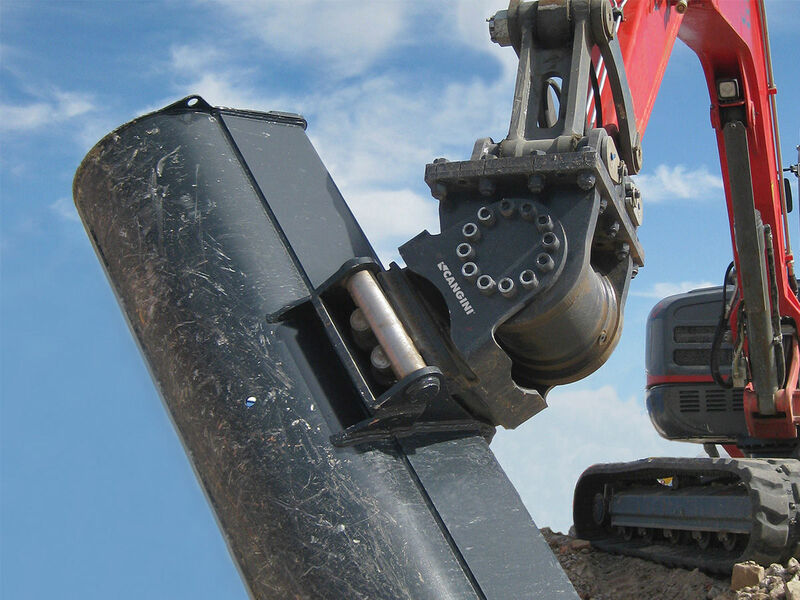 The bi-directional hydraulic actuator enables to tilt tools or quick couplers up to 70°and to simplify the digging operations also in places difficult to reach. 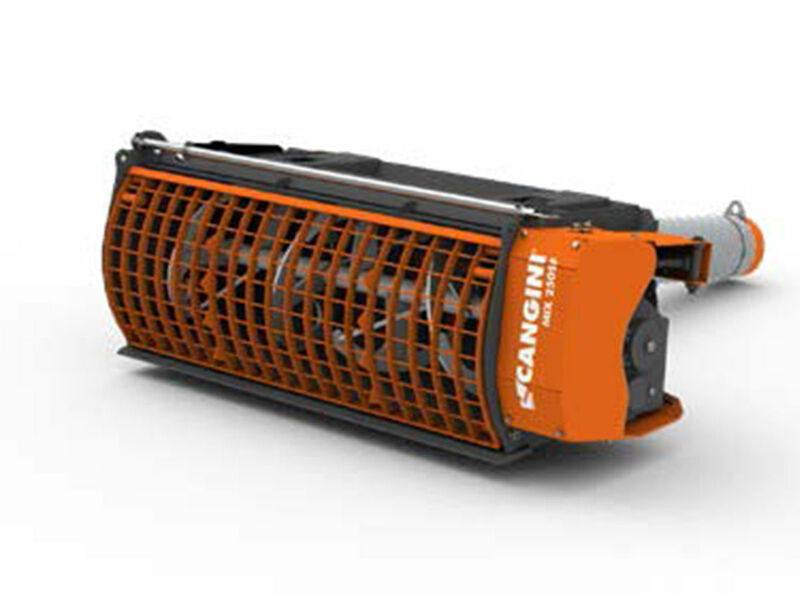 Combined with Cangini’s hydraulic quick couplers this rotary hydraulic actuator enables to tilt any attached tool by 55° and to rotate it by 360°. 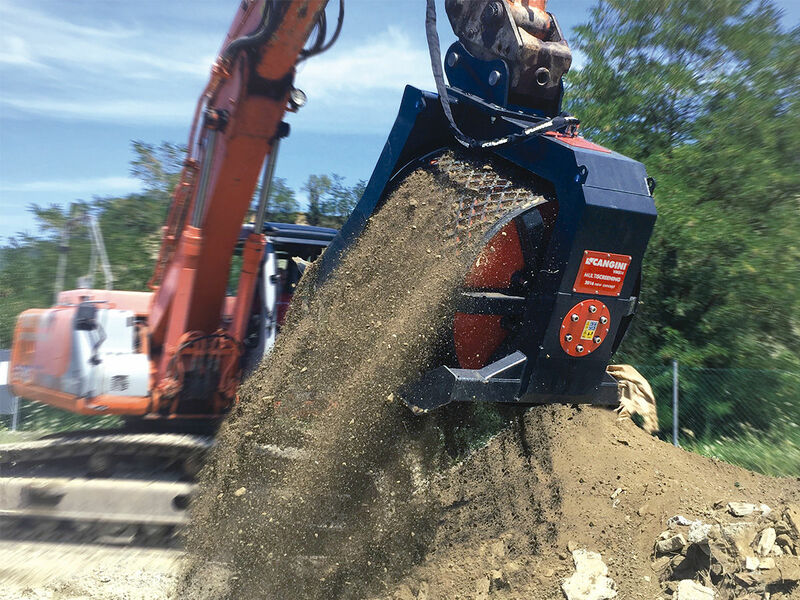 The use of dual cross relief and throttle valves grants effectiveness and reliability even in the most difficult work conditions. 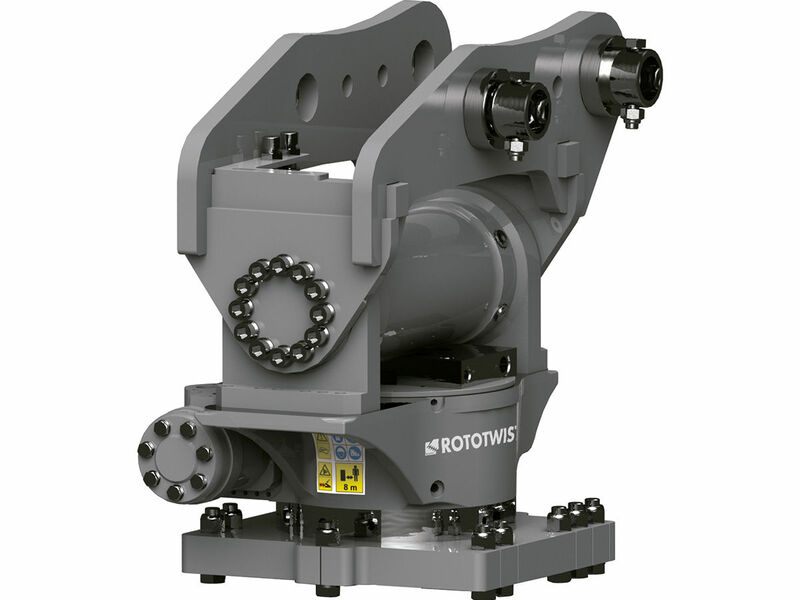 Hydraulic joint for the hydraulic power supply of the tool attached to the Rototwist. Hydraulic rotation standardized on all models. Designed to handle different materials. 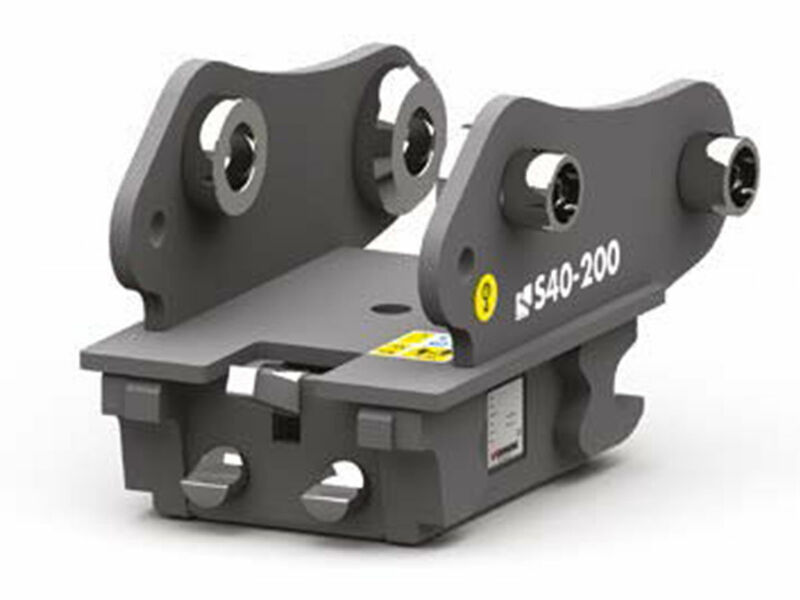 HB400 clamps with Bolt-on reversible cutting edges. 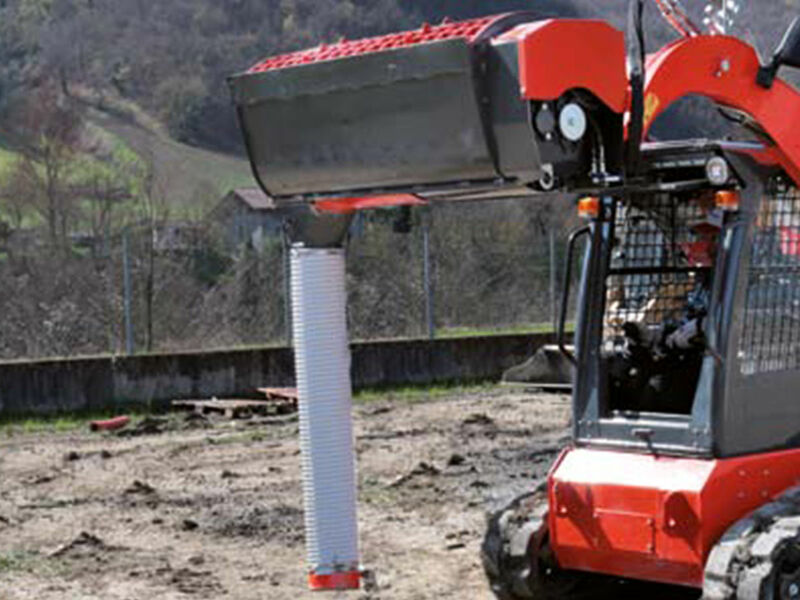 Its strong frame allows operators to use it also for light demolition works. 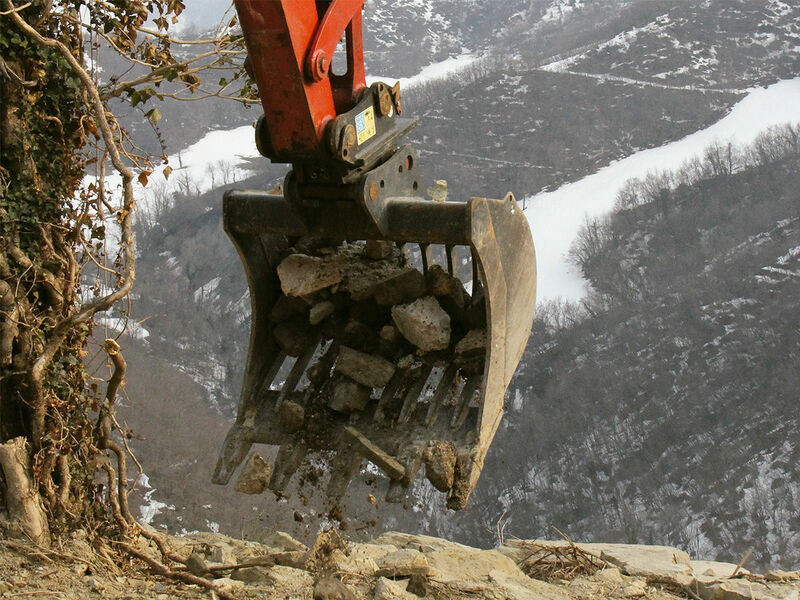 It grades materials from demolition, digging and earth-moving works. 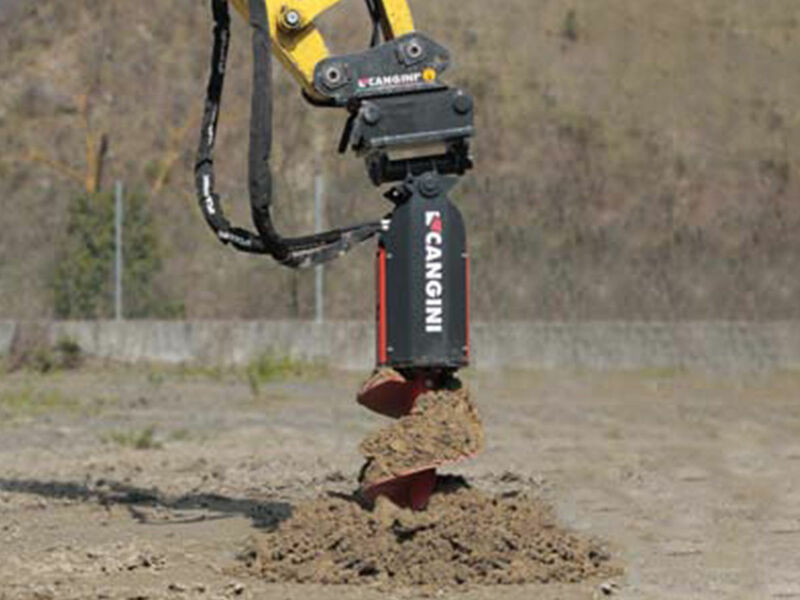 It is ideal also for the mixing of terrain and peat. 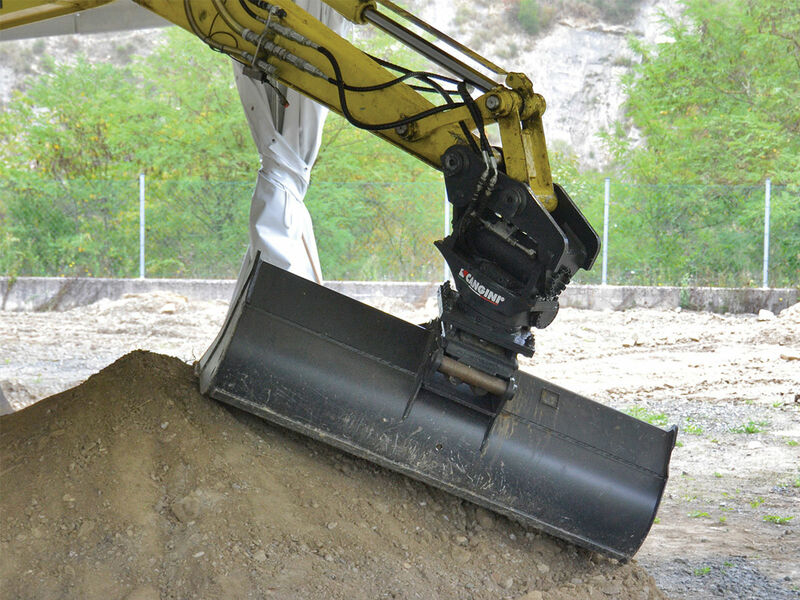 The core-element is an hydraulic sieve with rotating HB400 knives. 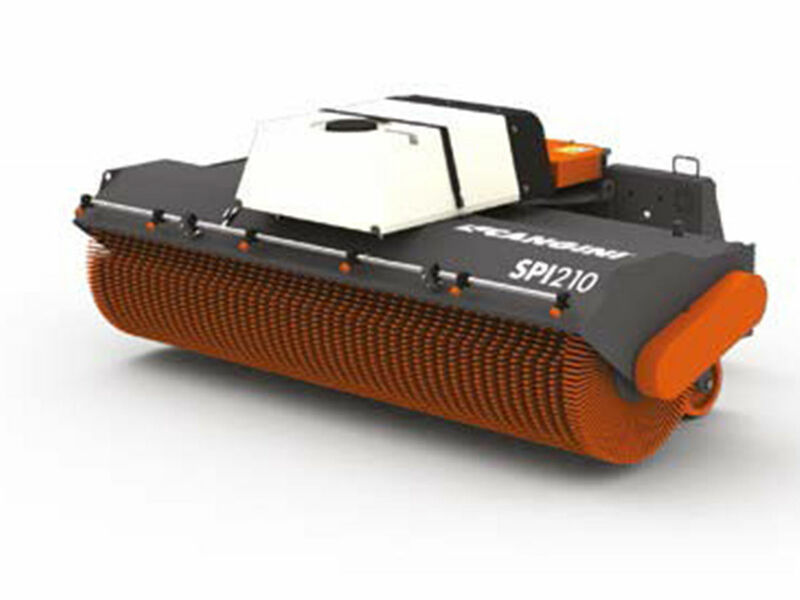 The material thickness can vary from 0 to 20 (0 - 0,8 in) and from 0 to 35 (0 - 1,4 in) with a standard equipment. Customerized shafts can be supplied. 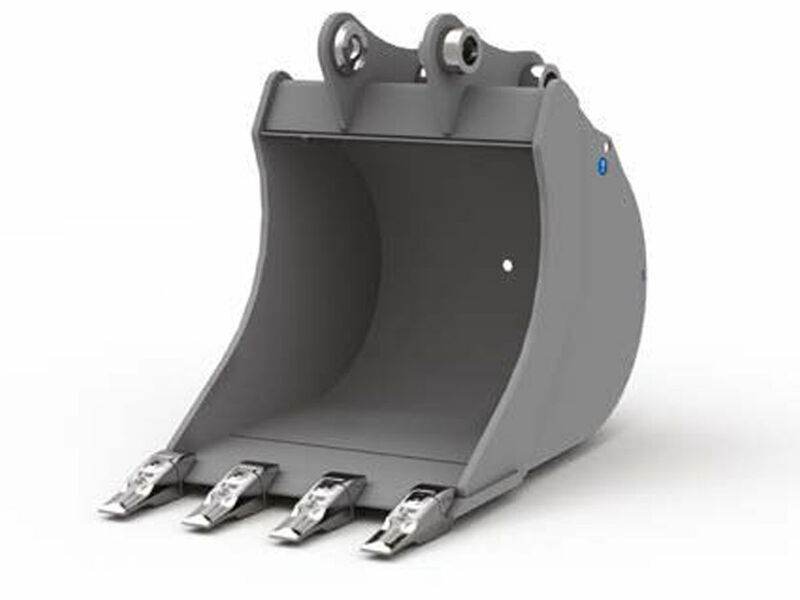 The new Multiscreening bucket for frontal coupling, with two rotary double drums coupled in a single frame, is suitable for selection duties on turned soils and resulting materials. 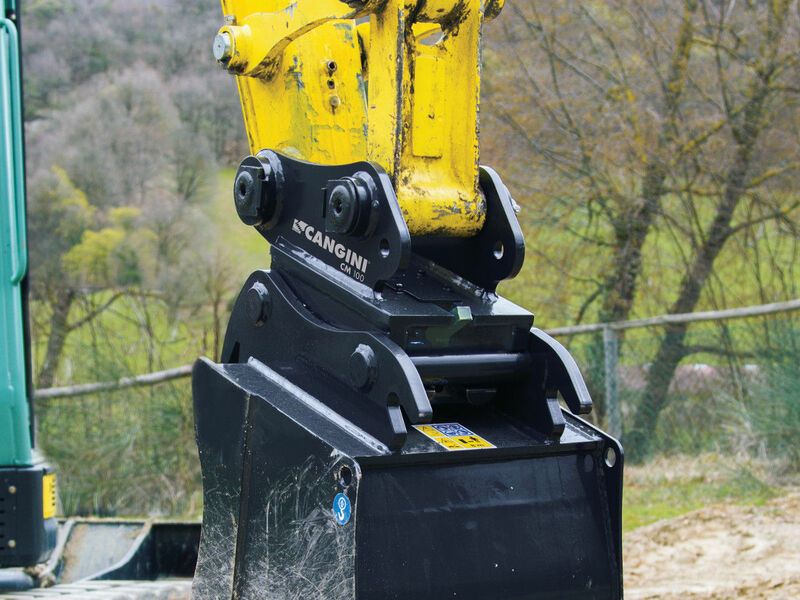 The material size change, from a minimum of 25 mm to a maximum of 60 mm (1 - 2,4 in), is hydraulically controlled from the cab without replacing any mechanical piece and considerably reducing the working times. Rotation of 360°. Parts subject to wear are made of Domex 700. 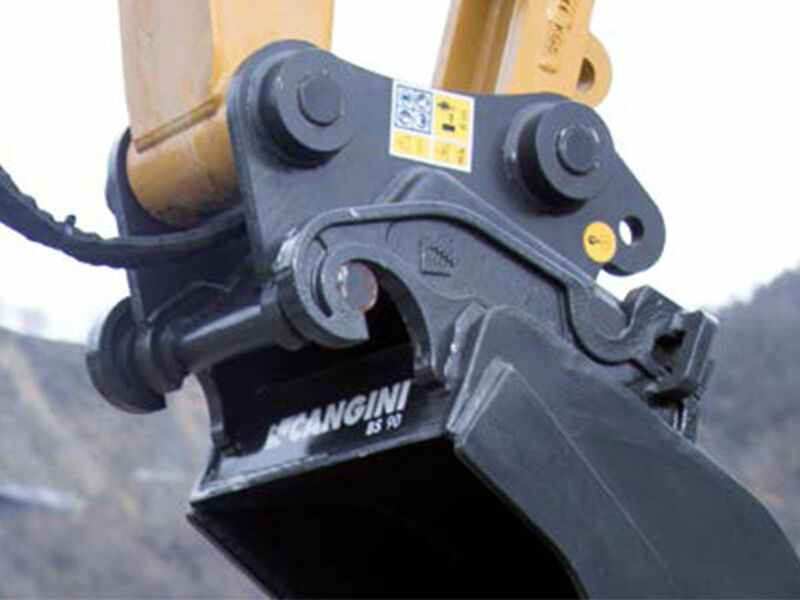 A safety check-valve is provided as standard equipment on the clamp-closing cylinder. 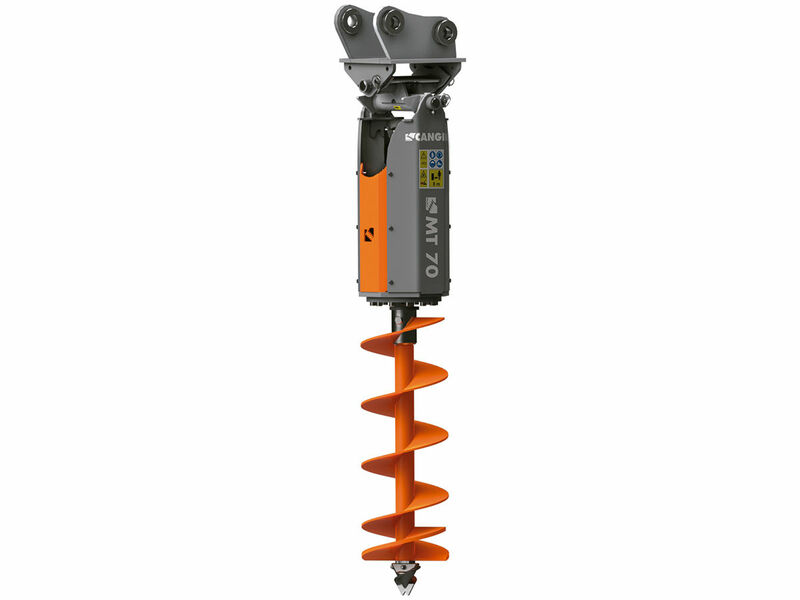 The bidirectional hydraulic auger is equipped with a transmission with epicyclical gearbox and double tilting joint. A steel envelope protects the gearbox against shocks. 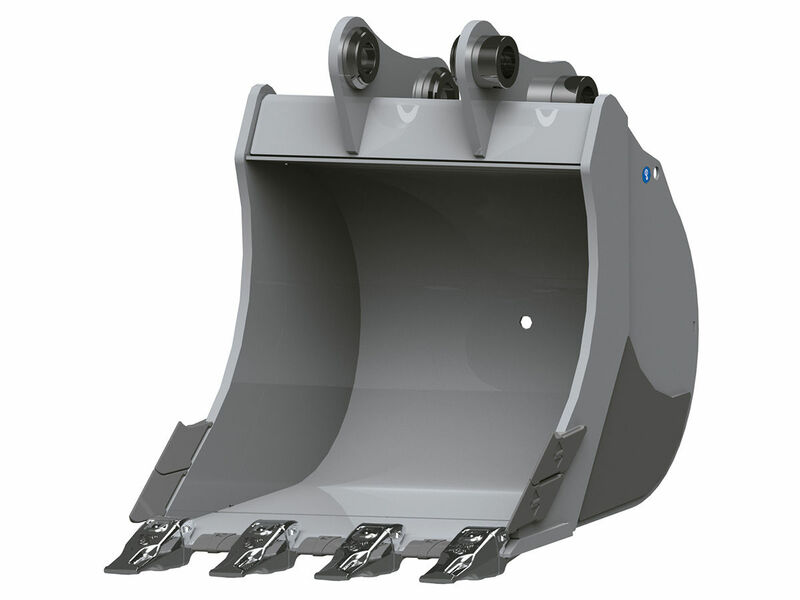 Designed for heavy-duty operations, it is equipped with a reinforced double-frame; an anti-shock shielding protects the bearings. Standard Y blades with intermediate knife or hammers. Flow-divider, pressure relief and bypass valves (for TC0-50 and TC0-70 only pressure relief valve) . 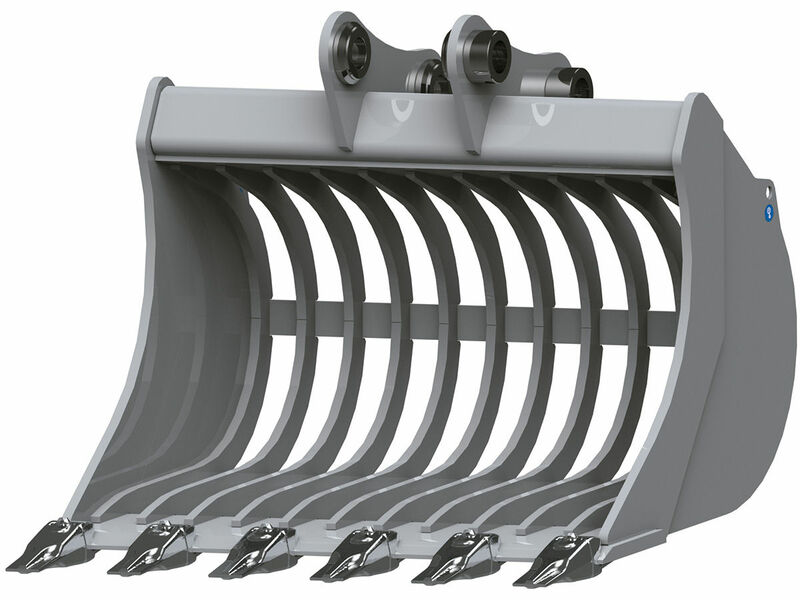 Max back-pressure allowed is 10 bar, therefore TC mulchers do not require any drainage line in most of the cases. 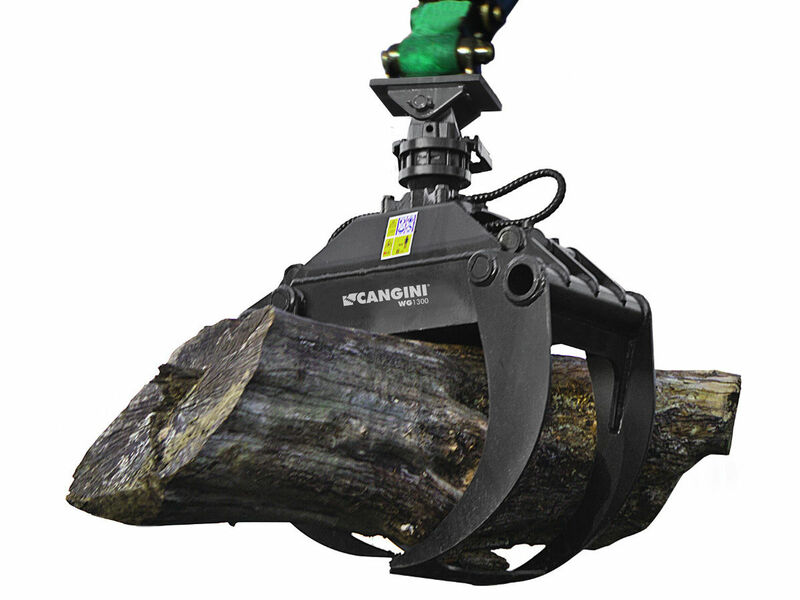 Suitable for the tree pruning up to 100 mm (3,9 in). It tree pruning. It does not harm the plant, because it cuts sharply and precisely without uprooting the branch. 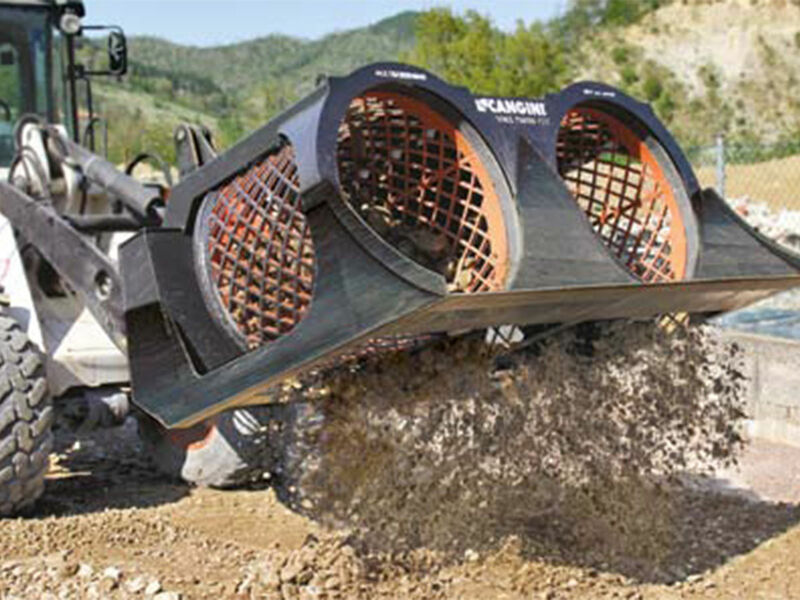 The bar’s blades in HB450 grant resistance and extended useful life. 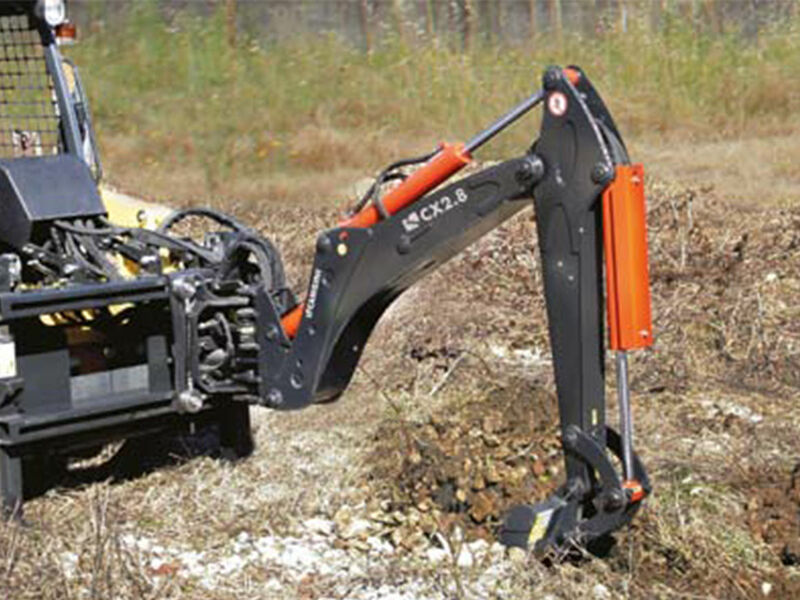 Particularly suited to operations in areas where the machine’s standard range of action is not sufficient. 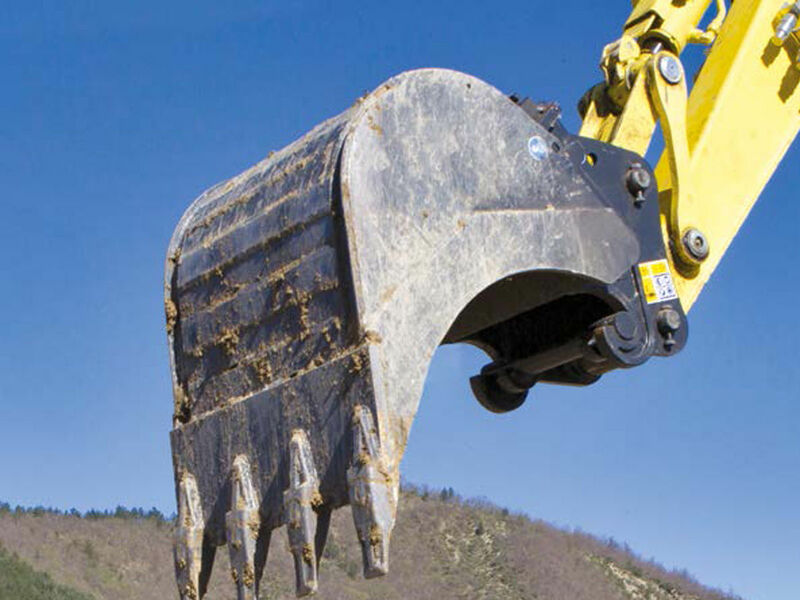 The extension arm is supplied as a “partly completed machinery” Certification in accordance with the Annex II-B of the 2006/42/EC Machinery Directives. Its EC compliance will be declared after it has been attached to the machine and before its regular use. 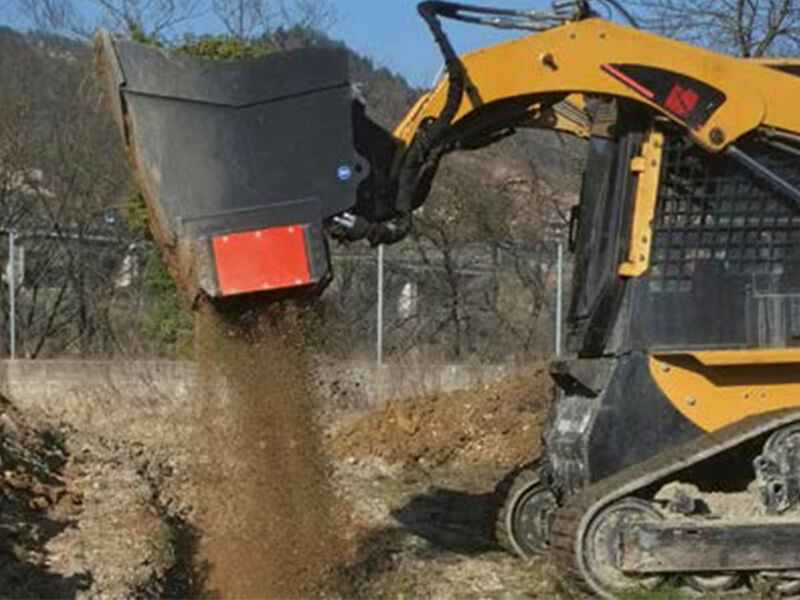 Backhoe fit for skid loaders. 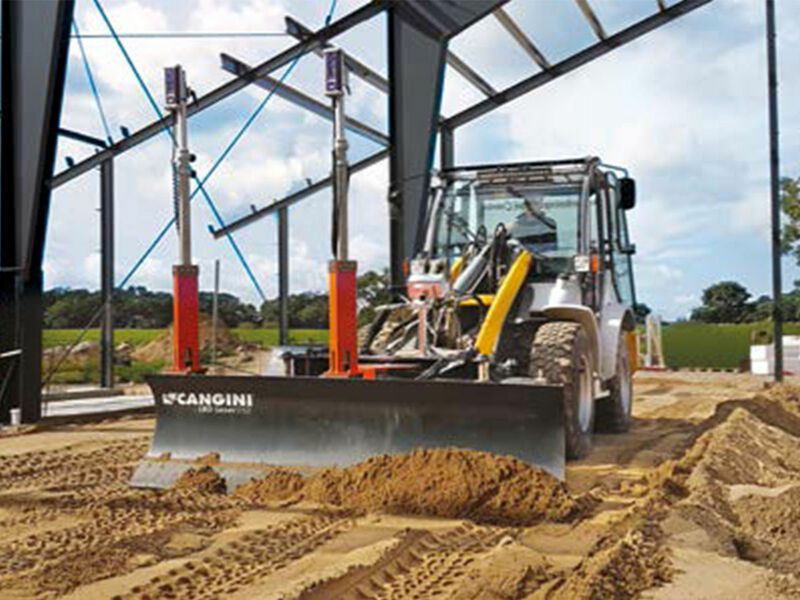 Standard equipment: side-shifting frame with standard hydraulic blocking system and auxiliary output; boomerang boom for 2.8 and 3.1 models; independent telescopic hydraulic stabilizers with safety block valves; 400 mm (16 in) digging bucket. Hydraulic controls and distributor with joystick lever control. 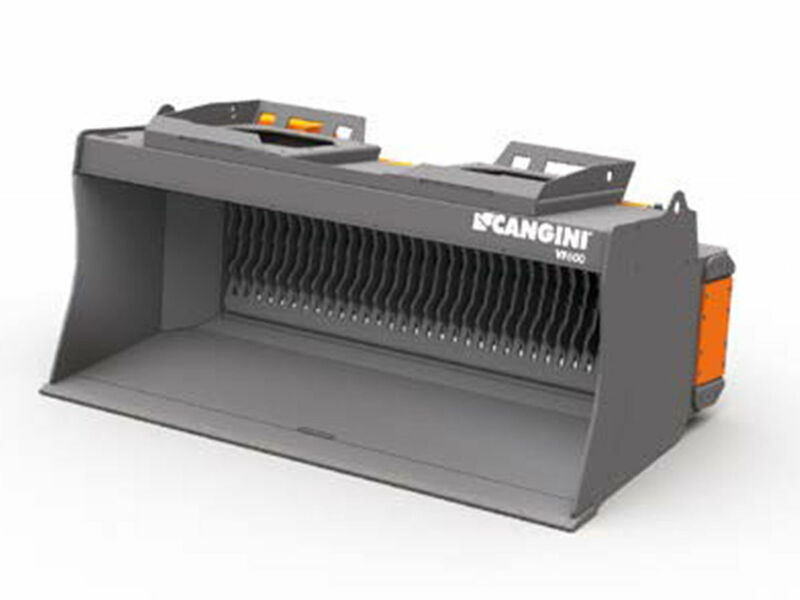 Suitable for loading, unloading and handling operations. 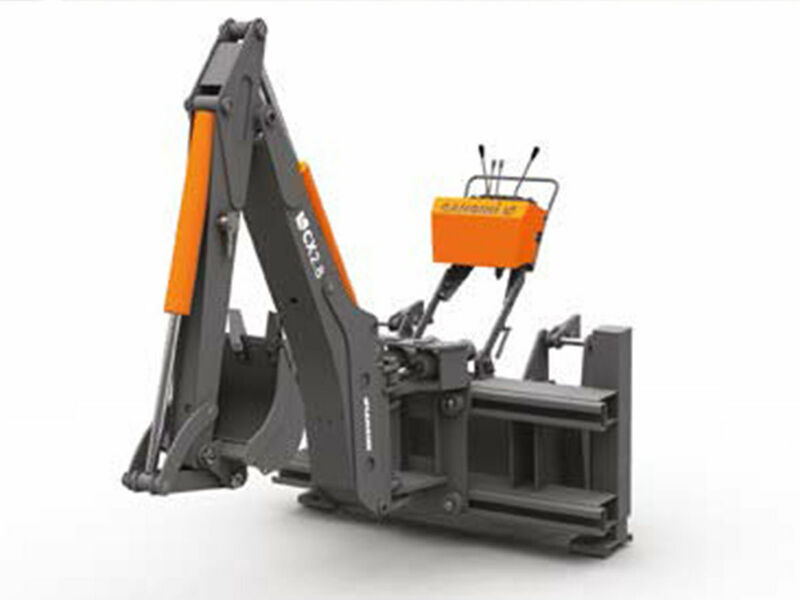 Thanks to its hydraulic opening it is suitable also for various material grabbing, waste discharge control and ground levelling. 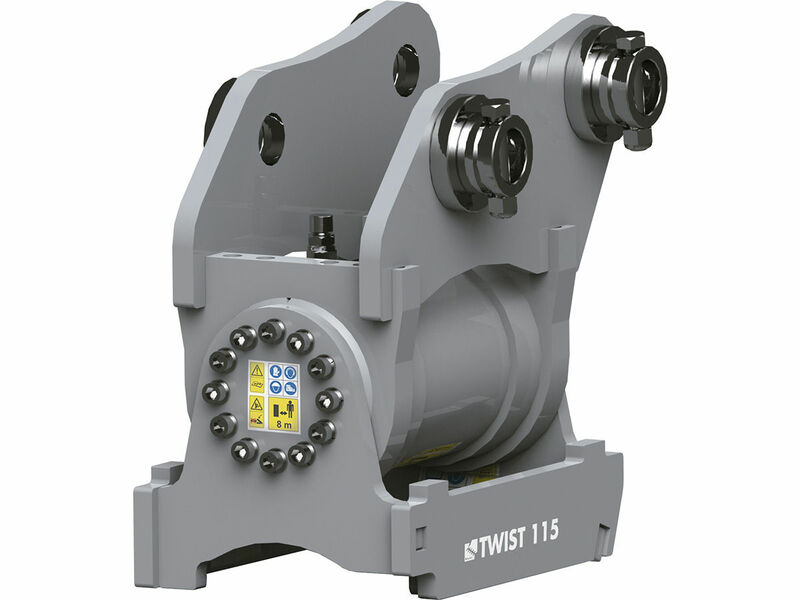 Gearbox transmission delivers high performance and is almost maintenance-free high performances and does not require continuous maintenance interventions. The use of dual cross relief and flow divider valves grants effectiveness and reliability even in the most difficult work conditions. 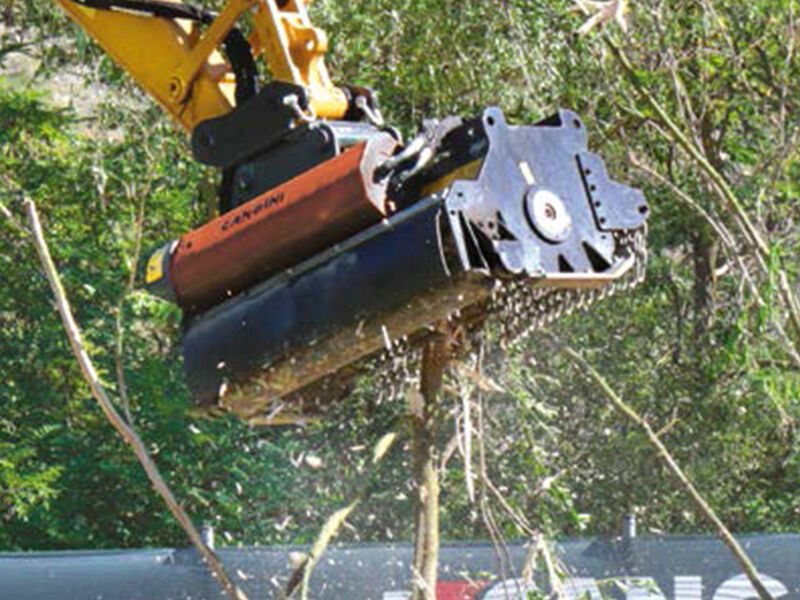 This brush can be applied to excavators. 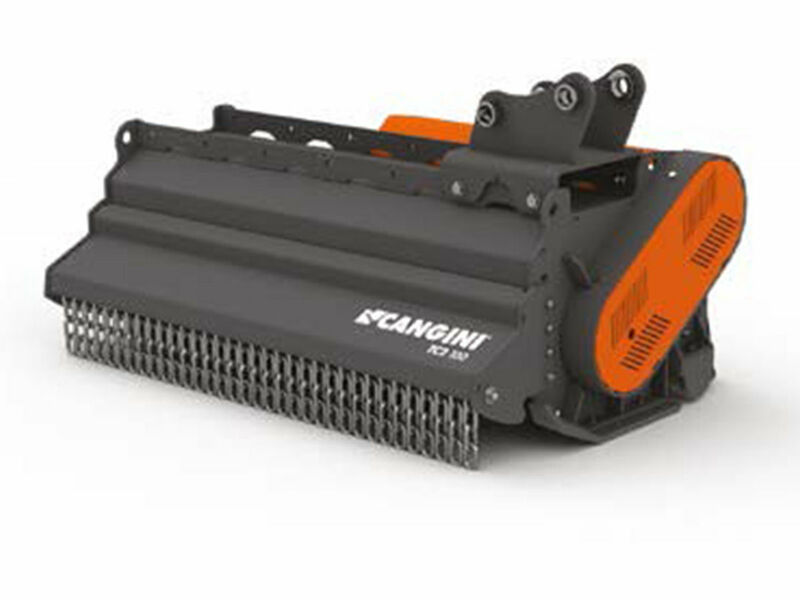 It is made of steel bristles and therefore ideal for the deep cleaning and weed-removal of curbs, platforms and banks, and asphalted areas. 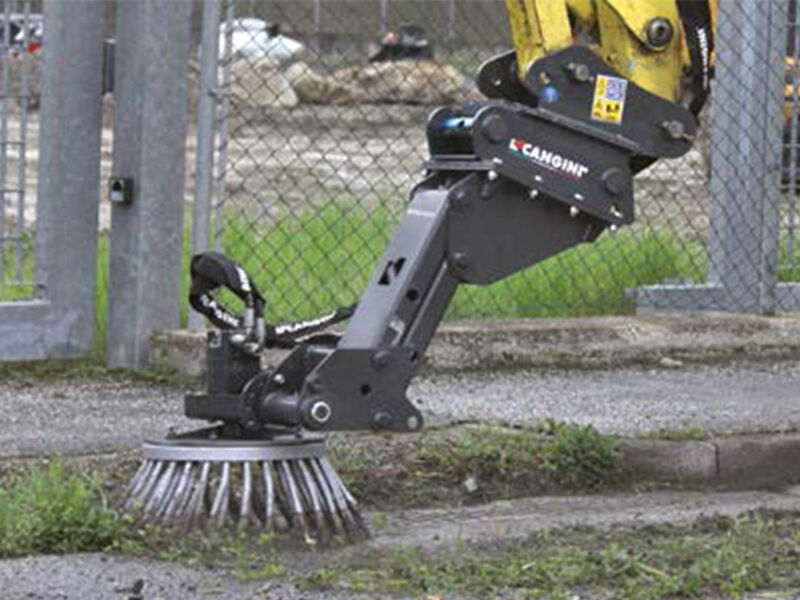 It is equipped with standard floating system and joint on its head that enable the brush to adapt to any surface. Both positioning systems can be blocked to a fix position following the utilizer’s needs. 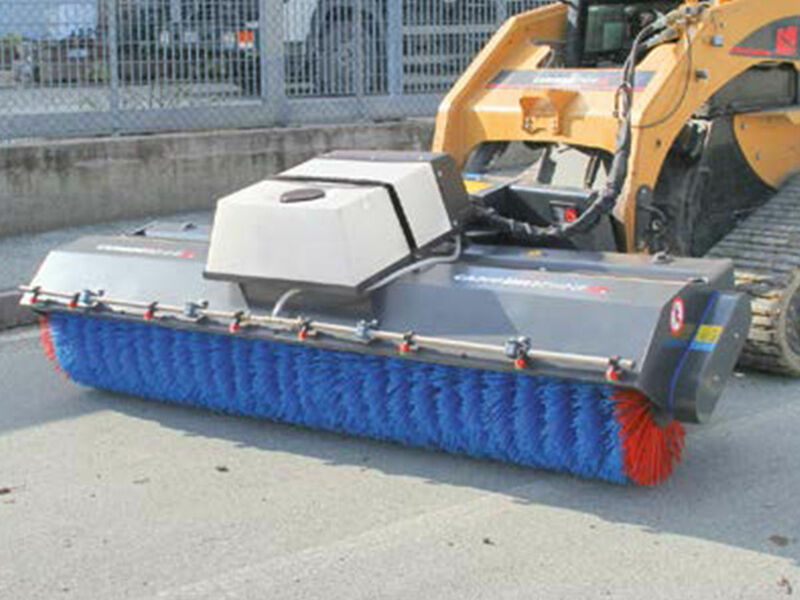 In its ppl bristle version the brush can clean more delicate surfaces where the weed-removal is not necessary. 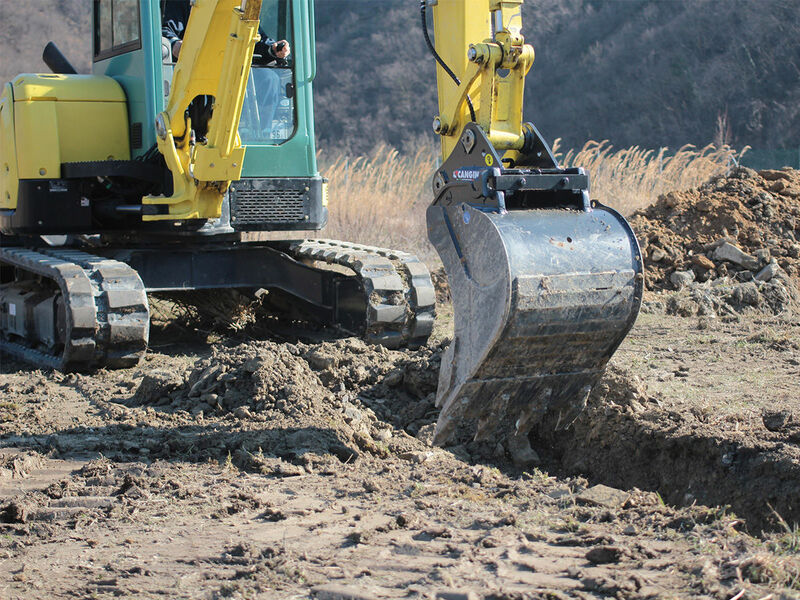 The laser dozer system can rely on the same characteristics of versatility and resistance as the standard dozer blade, but it also allows creating a plane thanks to a double-slope laser transmitter. Taking its effect directly on the electro-proportional distributor, the transmitter drives the blade. Particularly suitable for heavy works. 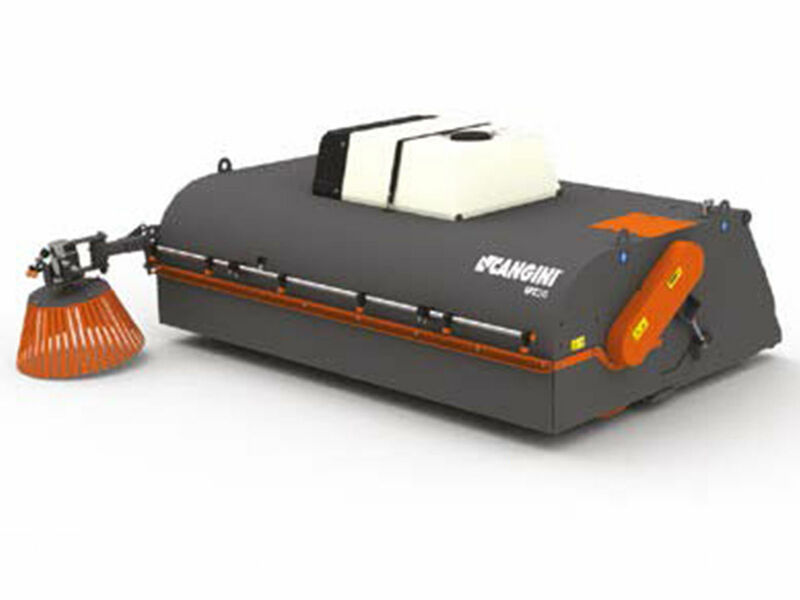 It is equipped with a waste collection tank with reversible and and with bolt-on reversible cutting edge. 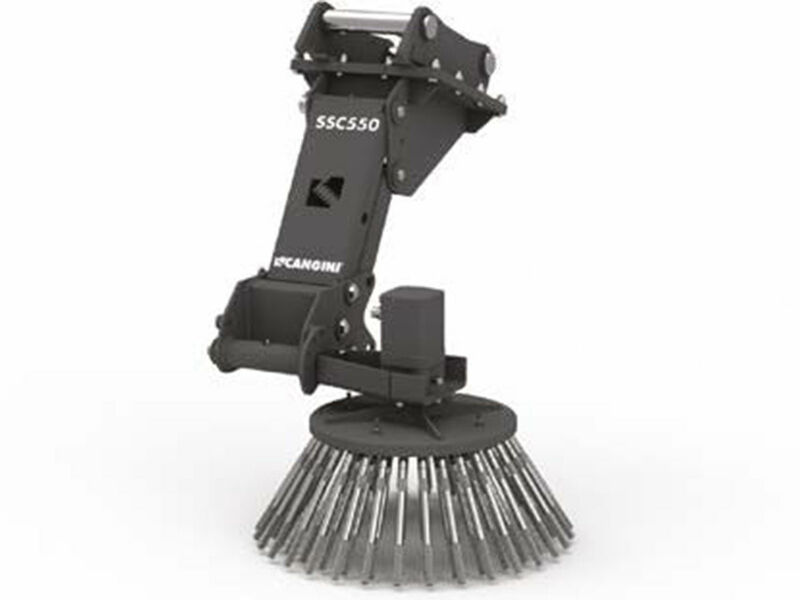 Sweeping roll adjustable height. 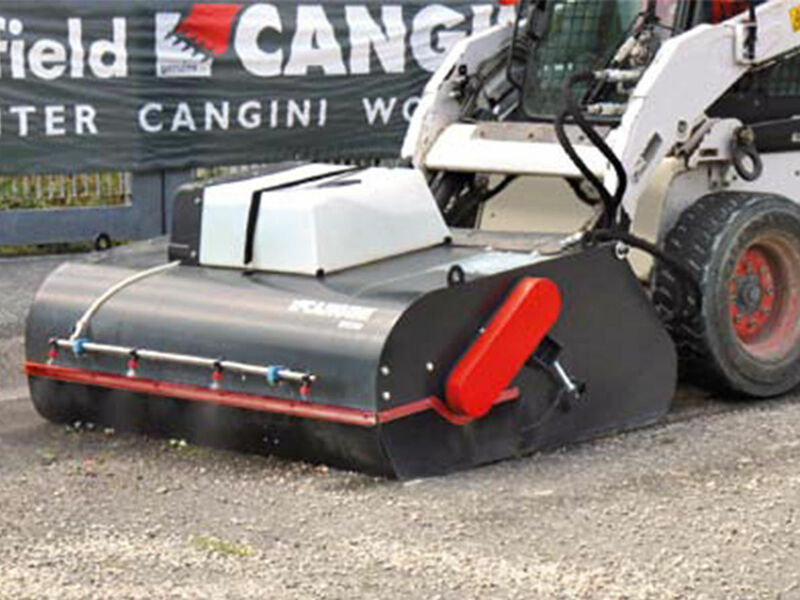 It is mainly used to clean surfaces where the waste removal is not required. 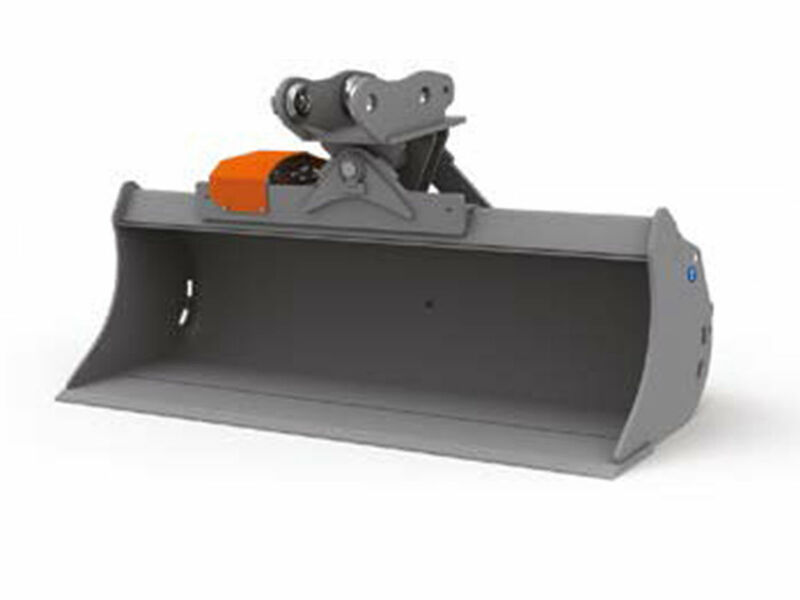 It is used for the snow removal in open areas and streets. Horizontal self-levelling of ± 10°. 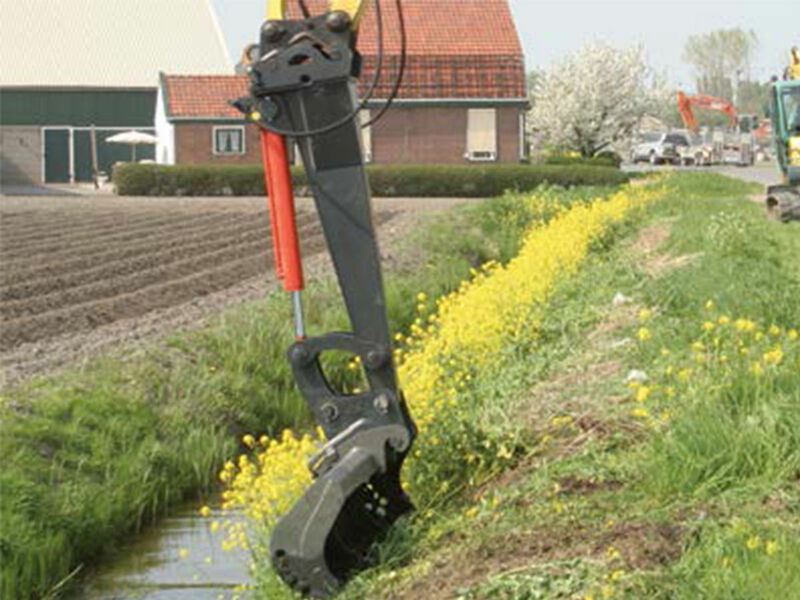 Hydraulic angle adjustment of ± 30°. Pivoting wheels with rubber treads. © All rights reserved, COHIDREX, S.L.